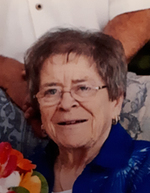 Marilyn Mae (Boyd) Higgins, 82, passed away peacefully surrounded by family and friends on September 29, 2018. Born in Belmont, Colchester Co., she was the daughter of the late Albert Cecil and Inez (Whippie) Boyd. Marilyn taught school for several years after graduating from Normal College. After she finished teaching, she helped manage several family businesses. She had a sharp wit, a great sense of humour and always had a hilarious joke to tell. You could always hear that telltale wheeze once the laughs got rolling. She was a great mother, Nana, aunt and friend to many. Her children and grandchildren will always remember her with love and smiles from the memories. Marilyn is survived by children, Steve, Truro, Kenda (Brad), Ottawa, and Tonda (Wade), Truro; grandchildren Kayla, Sara, Zachary; step grandchildren Alex and Brandon; good friends Arlene and Glenna. Also surviving are brother, Benny (Grace); sister, Lois; sister-in-law Heather, several nieces and nephews. Predeceased by brothers, Ritchie (Emily), Kenny, Frank, Raymond and sister, Carole (David), brother-in-law George. Visitation will be held Monday evening, October 8 from 6 - 8 pm with a Funeral Service celebrating Marilyn’s life being held Tuesday, October 9 at 2pm both in Colchester Community Funeral Home, 512 Willow St., Truro, with Marty Clark-Ettinger officiating. Reception will follow. Interment in Lower Onslow Clarke Cemetery.